In the northeastern United States, this week is President’s Week were we celebrate two of our most famous and beloved US President’s birthdays, George Washington and Abraham Lincoln. Abraham Lincoln is honored locally by an unique statue found on the Syracuse University campus I photographed last year. American sculpter James Earle Fraser’s bronze cast of Abraham Lincoln was installed in front of Maxwell Hall on the Syracuse University campus--lowered into place by a 50-foot crane in 1968. The statue weighs 2,770 pounds. 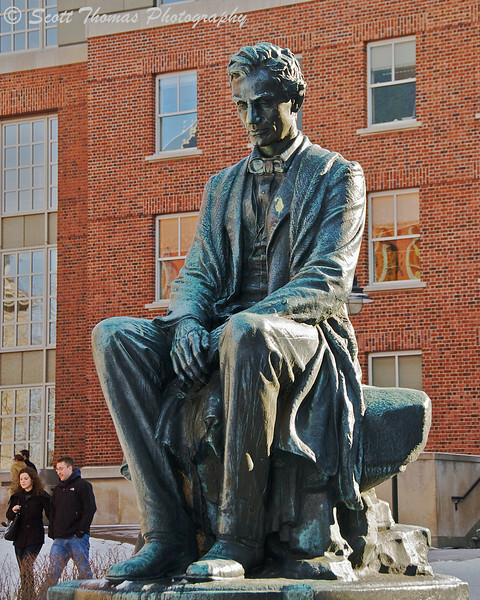 There are so many inquires about this statue, Syracuse University published the story of how it came to rest in front of Maxwell Hall in a piece called A different Lincoln. This entry was posted in Travel and tagged 18-200mm vr, abraham lincoln, birthday, bronze, james earle fraser, maxwell hall, new york, nikon D70, Photography, president, statue, syracuse, syracuse university, united states. Bookmark the permalink. I really enjoyed this, Scott. Thank you for the striking image and for the link. I love history and Lincoln’s legacy in equal measure, and had never known about the statue in Syracuse. What a fascinating story! Isn’t that a great story? Over a hundred years later and Lincoln still stirs our hearts for our country. Abe would love to see this. Thank you for the compliment. Lincoln was the first President to be photographed throughout his Presidency. Now, every US President has an official photographer. The statue looks huge in comparison to the people in the background, nice composition. I believe the statue is a little bigger than life sized and on a pedestal. I waited for some students to walk into the frame because the photos I took without people looked very static.